Digsy.ai, Powered by Flatfile.io, the new standard for data import. Digsy.ai is a Smart Commercial Real Estate lead generation platform which helps broker teams automate their workflow to accelerate the conversion of prospects into new business leads. With Digsy, real-estate brokers can bulk-upload customer data in the form of a CSV, to help them set up prospects and track lead activities. This import is a key early step for Digsy’s customers, and building a CRM for the real-estate industry meant ingesting files from a variety of data sources, many of which were formatted in an inconsistent manner. Early on, Digsy created their own importer for customer data. After spending countless hours of their support team’s time formatting files for upload, however, they knew they needed a solution that would scale at the rate of their own business. That’s when they found Flatfile.io. To address the challenge of getting customer data quickly into their CRM, the Digsy team originally built a custom CSV data importer. Although their homegrown tool got the job done, it was lacking important functionality needed to truly automate their bulk customer data imports. One crucial missing feature was column-matching functionality. Despite flagging import errors on file upload, their custom-built importer lacked a column-matching interface and functionality. Their user base quickly outgrew the custom importer, and uploads were not scalable. Having column-matching functionality in place would reduce manual cleaning performed on imported spreadsheet data. It would also consistently match and format imported CSV data into Digsy — without straining the team’s internal resources, or increasing end-user import friction and frustrations. One alternative solution Digsy relied on, was manually placing incoming CSV data into a pre-made spreadsheet template, that would then be uploaded into their application. However, this proved to be inefficient, since their custom data importer required an exact match for the incoming datum. The team constantly had to adjust their customers’ CSV data, place it within the premade import template, and finally be able to import the CSV file into Digsy. While Digsy could have asked their customers to use a pre-made spreadsheet, it would have created significant friction during the new customer experience. So much so, that some customers may reconsider using the platform entirely due to the complexity of importing their data. In today’s SaaS landscape, users expect every step of a service to be seamless from start to finish. Data imports have been historically frustrating due to the countless variables at play. Digsy couldn’t take that risk as an early stage startup and instead decided to offer data import as a service for new customers. The team quickly found themselves manually cleaning customer data files prior to importing them. Although they could import up to 3,000 rows using their custom tool, the team had to consistently spend 8–10 hours on fully preparing and importing all their new customers’ data. To their mounting frustration, the Digsy team would clean a customer’s data for hours, only to see the customer churn. Their data import model was, at the time, wholly inefficient. The Digsy team needed to make a decision. Would they dedicate the development manpower to building column-matching functionality into their custom data importer, or find a tool that provided this functionality? Luckily, a member of Digsy’s product team heard of Flatfile.io and presented the CSV importer tool to the rest of the team. The team searched high and low for alternatives prior to testing Flatfile, but could not find a comparable data importer that addressed their functionality needs. The team quickly created a Flatfile account, and using the developer documentation, were able to fully integrate Flatfile into Digsy within one development sprint. 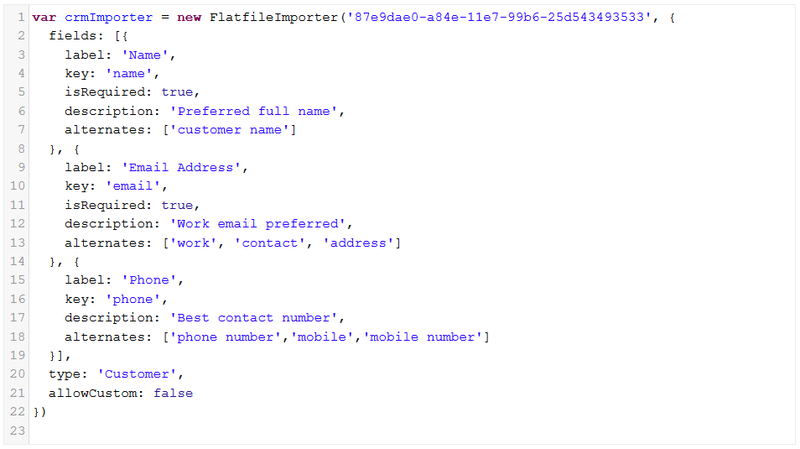 Flatfile’s simple JSON configurator allows CSV fields to be mapped to specific data models seamlessly. Subsequent CSV data imports from users will adhere to this data model. 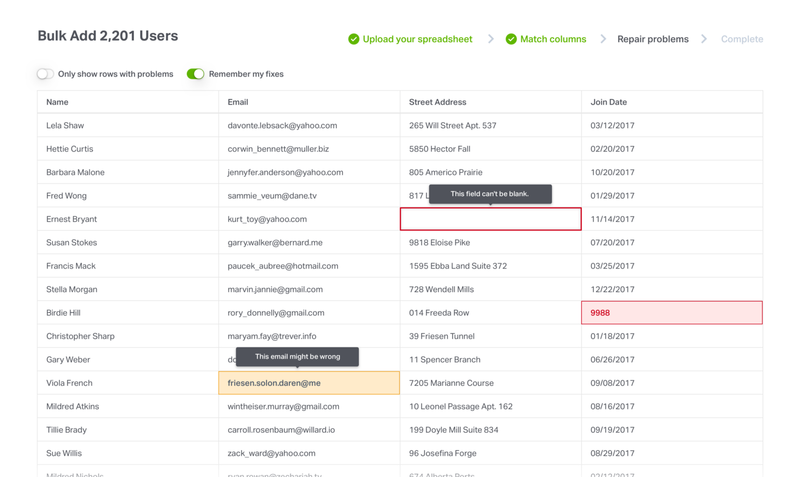 Flatfile’s column matching feature is by far the most valuable functionality the Digsy team relies on for clean customer data imports. The team enjoys seeing import errors clearly called out, expressing that: “…it feels like a matching game!” Flatfile’s fuzzy-matching algorithm ensures that over 95% of columns are matched automatically, resulting in less data import friction for everyday users, as well as significant time savings for Digsy’s support team. In addition, column mapping is saved on import, which makes subsequent CSV uploads seamless. Success stories like Digsy’s are the reason why we built Flatfile.io. Saving our customers time and effort from building custom solutions is nice, but creating a great experience for a process that used to be frustrating is what keeps us going. The Flatfile team is ambitious in our pursuit of delightful data imports, and we look forward to working with Digsy and all of our customers to solve any problem related to getting data into web-based software applications. To learn more about Digsy’s Smart Commercial Real Estate lead generation platform, visit digsy.ai or email care@digsy.ai, and if you would like to sign up use the code DIGSY50 for $15 off per month. Flatfile is the new standard for data import. By improving the speed, accuracy, and user experience associated with file uploads, Flatfile has earned the trust of dozens of SaaS companies eager to improve their customers’ file import experience. The company, founded in 2018, is comprised of leaders with experience building innovative solutions at Hubspot, AirBnB, Envoy, MailChimp, FullStory, and others. To learn more about Flatfile, contact hello@flatfile.io or start a 30-day free trial at flatfile.io. Flatfile.io. The new standard for data import. Delight your customers with a seamless data importing experience.